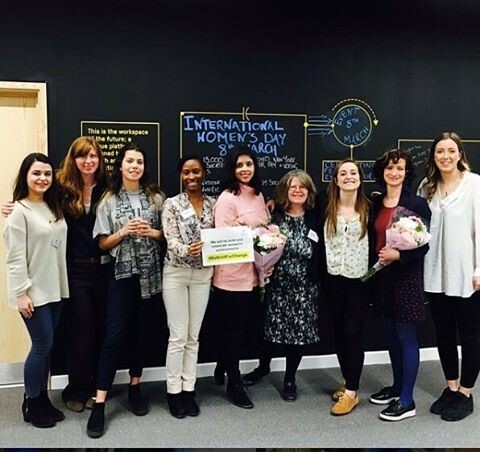 As part of International Women’s day 2017, the Female Entrepreneurs Team from the BA (Hons) Team Entrepreneurship programme, chose to host an event that celebrating female entrepreneurs. Inspired by the theme for International Women’s Day 2017, Be Bold for Change, the students wanted to host an event that that celebrated women’s achievements as well as inspiring other women to become entrepreneurs, leaders and change makers. The event showcased 8 different female entrepreneurs at various stages of their journeys and the barriers they have overcome. The entrepreneurs were introduced by Deputy Vice Chancellor, Jane Harrington. The speakers included Katie Alcott, Founder and CEO of Frank Water; Neha Chaudry, Founder of Walk to Beat and Helena Hills, Co-Founder and CEO of True Start Coffee. A full list of all the speakers can be found below with their top tips for other budding entrepreneurs. The event was held at UWE Bristol’s Future Space and was attended by over 80 people. The event was organised by Alice Lumley, Danielle Seprersaude, Jade Marsella from the Team Entrepreneurship degree and their team coach Ainhoa Esnaloa. The multi award-winning TrueStart Performance Coffee is the only coffee in the world designed for sports performance. Helena and her husband Simon came up with the idea during IronMan triathlon training, and officially launched last year to phenomenal public response. A Bristol-based start-up, TrueStart have built and army of incredibly loyal customers. Marion is a design entrepreneur who runs the UK’s first ever design-led start up accelerator. In this role she draws from her own experience as an entrepreneur herself to provide a supportive experience for start-up founders. Marion studied product and industrial design in Paris and London and she has over 10 years’ experience in setting up unprecedented collaborations between international brands (Longchamp, Clairefontaine) and small design companies (The Heatherwick Studio, Charlene Mullen). Community of Purpose exists to empower people and their communities to overcome big challenges. Community of Purpose uses a range of programmes to increase sports participation, raise educational attainment, reduce health inequalities and support socially excluded groups access services so they can realise their potential. Tess O’Shea is at the start-up stage in her journey and is a graduate from UWE, who started the enterprise internship last summer with a passion for pre-loved clothing. She was unhappy with the mass production of fast fashion and the vast CO2 emissions of the clothing industry. She started selling on Depop and then progressed into the pop-up shop space at UWE. She is currently embarking on a new venture, Seatox, which is an edible and cosmetic seaweed business. Neha is a UWE alumni and founder of the start-up called Walk to Beat, partly based at the Bristol Robotics Lab. The first product developed by Walk to Beat is a walking stick designed for Parkinson’s patients to help them improve their walking problems. Walk to Beat is further set to design stream of assisted living products to empower the ageing population. Recently she has been awarded UWE 2017 Social Entrepreneur of the year award. In 2005 Katie came up with the concept of FRANK Water through which she could raise awareness of world water issues – saving lives by supporting safe water and sanitation programmes and being pragmatic by initially raising funds through the sale of bottled water in the UK. FRANK Water Projects, which has funded over 300 sustainable, community-run safe water and sanitation programmes across rural India. Dedicated to supporting those most in need; the marginalised, tribal and hard to reach communities, research and development of technology and approach are key to the organisations future. Esoterix Systems is running the Mobility on Demand Laboratory Environment (MODLE), an Innovate UK sponsored project, in North and West Bristol. The project is exploring new services, mode integration and business models to offer flexible transport options which meet users’ complex transport needs.